#oliviamurphy – Irish sailing has lost one of its best-loved people with the death of Olivia Murphy of Sutton in Dublin at the age of seventy, after a gallant five month battle with cancer. Her crowded and moving funeral on Saturday – the Feast of the Assumption - was eloquent testimony to the local, national and international popularity of this leading sailor, who for very many years was half of the formidable duo of Pat and Olivia Murphy, yet had many other personal interests and pursuits of her own. 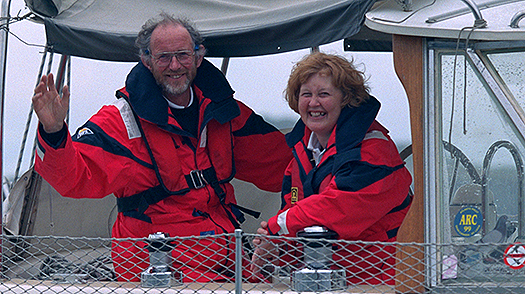 Having been renowned figures in dinghy sailing – particularly in the International GP14 Class, where Pat competed at world level - together they went on to become involved with cruiser-racing with a variety of boats, and then they made an extraordinary nine year voyage round the with world with their carefully chosen 40ft long-distance cruising sloop Aldebaran. The scope of their achievement in completing this voyage – which took them to 36 countries – is way beyond the imagination of most amateur sailors. Yet Pat and Olivia – crewed from time to time by friends, but often sailing entirely on their own – saw it through with determination and skill. They enjoyed what they were achieving together so much that what had been originally intended as a four year project was – largely at Olivia's instigation – extended to become a magnificent and very varied nine year voyage. 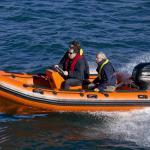 Their's was a very busy life, for in addition to active sailing himself, before handing over the running of the business to his son Shane the energetic Pat very effectively was Dinghy Supplies, the ground-breaking marine retailer which was ahead of the curve in many sailing developments. Yet Pat and Olivia's married life was a wonderful shared story which was by no means entirely dominated by boats and the sea, as they also enjoyed ski-ing together, something which they took up during their honeymoon. That in itself well expresses the way in which this couple of many interests progressed so fruitfully through life. However, Olivia was also someone who had time for everyone, and took much pleasure in the more contemplative aspects of life, to which she brought a quiet spiritual strength. Her long marriage to Pat was mutually supportive to an exceptional degree, and was blessed with children and more recently with grandchildren, to whom Olivia was devoted. It was utterly typical of her that, on the night before she died, on hearing that her grand-daughter Lilyanne had started taking riding lessons, she asked for some paper and on a piece of cardboard quickly sketched an inspirational and lively drawing of the young rider on her pony. Our heartfelt condolences go to the Murphy family on their very sad loss, to Pat and sons Shane, Padraic and Fintan and their families, and to the extended family and to Pat and Olivia's very many friends at home and abroad. Olivia Murphy was a quietly wonderful and truly unique person, and she will be much missed.